Mr Heal began training in October 1997 at age 9 at the Weston Do Jang (now closed) under SBN Andrew Brown. Mr Heal graded to Cho (1st) Dan on the 18th of November 2002, Ee (2nd) Dan June 12 2005, and to Sam (3rd) Dan on the 29th of November 2008. In his 15+ years of training in Soo Bahk Do, Mr Heal has traveled around Australia to train with various seniors from across the world, including attending the South East Asia Leadership Seminars (SEALS) event in both 2007 in Canberra and 2010 in Darwin. 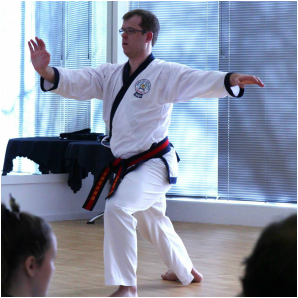 In October 2016 Mr Heal represented Australia in Korea for the 1st World Moo Duk Kwan Youth Leadership Symposium along side representatives from 12 other countries.